When I was a kid I loved to peel a lemon and eat it sprinkled with just a little bit of salt. My parents told me all the time this was bad for my teeth...while I wish I had listened to them, at the time I didn’t care as it was quite a delicious snack. Oddly enough my appreciation for lemon desserts didn’t begin until I was a little older--now I love lemon desserts. 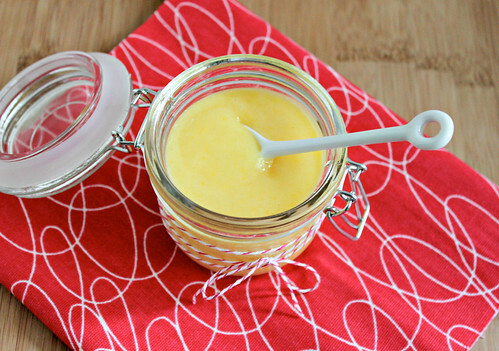 I have been wanting to make lemon curd for some time, but all the recipes I found called for several egg yolks. So I continued to search for a great recipe and finally found one that used 3 whole eggs. I reduced the amount of sugar and decided to omit the lemon zest so the texture would be smooth. Russell and I enjoyed fresh blackberries drizzled with this lemon curd and also spread some on top of some blueberry muffins. 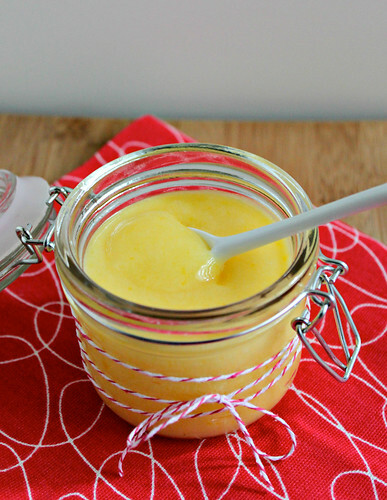 There are many possible uses for lemon curd: filling for a cake, topping on a scone or biscuit, mixed into yogurt--the possibilities are endless! However you enjoy yours you will find yourself going back for more lemony-goodness by the spoonful and enjoying every last bit of it! Fill a small pot with a few inches of water and bring to a simmer. In a medium sized heat-proof bowl, such as a pyrex bowl, whisk together the eggs, lemon juice, and sugar. Set heat-proof over the simmering water, ensuring the bottom of the bowl is not touching the water. Continuously whisk mixture until it becomes thick, about 15-20 minutes. Remove from heat and whisk in butter. Stir in lemon zest, if desired. Allow to cool, then pour in a clean container. Store in the refrigerator. Keeps for about a week (it might last longer but we had eaten ours by then).